We've laid out a few of our favorites gifts for $25 and under. This collection is the perfect fit for gift swaps with relatives, stocking stuffers, or the secret Santa exchange at work! The 500-pc Coffee Lover's Puzzle will be a hit with your favorite coffee fanatics! Pair it with anyone of our classic mugs to create a gift that anyone would want to steal! Want something a little sweeter? The newest holiday flavor from Just Pop In! is the perfect blend of white chocolate and peppermint! 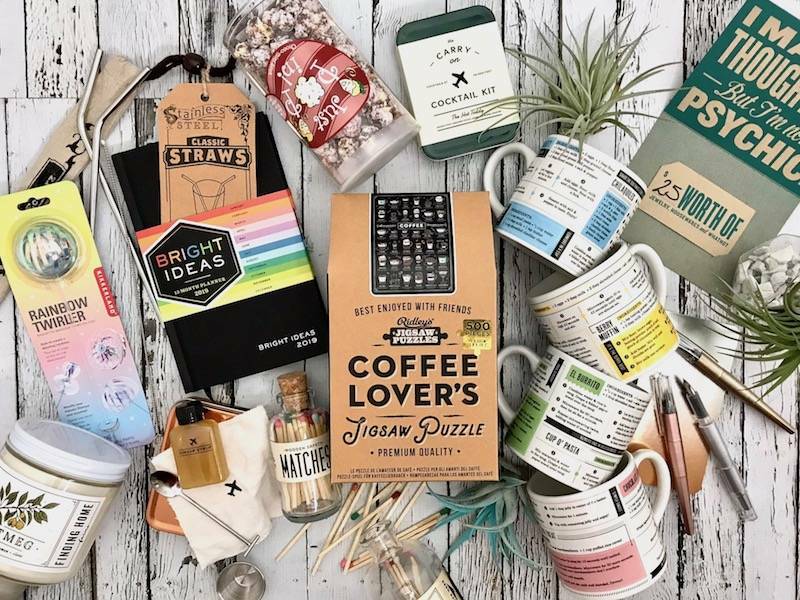 Toss it in with the Bright Ideas 12-month Calendar or a Carry-on Cocktail Kit and your gift will sure to be the talk of the holiday buffet. Reusable stainless steel straws also make a fantastic gift that stay in budget and stay green! Throw in a gift card to Silver in the City with any of our amazing soy candles and some rainbow tipped wooden matches to complete a gift set for your eco-conscious friends and family! Looking to add some greenery? Add a purifying (and low maintenance) air plant or two!